With battles, quests, political intrigues, and life-and-death struggles, An Insect Tale is a unique reimagining of high fantasy. 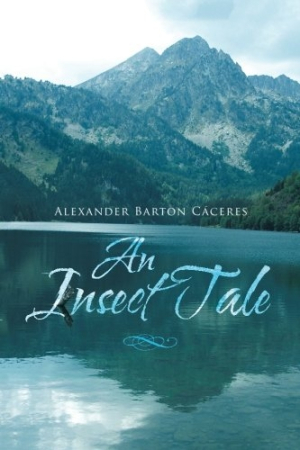 In An Insect Tale, by Alexander Barton Caceres, it’s up to three insects—a bee, a praying mantis, and a dragonfly—to wield their magic against overwhelming evil. This is an imaginative take on classic high fantasy. Lazimóff, Grizwald, and Múzlak are filled with wonder when they first glimpse a bustling insect port town. The trio comes from the Lost Island, home to the magical Kaldáre, who for thousands of years have placed several of their own in Insectdom to keep peace among the different kingdoms. The three magicians, sent to relieve three of their order, plan to spend the next millennium in relative peace, acting as roving diplomats and mediators. Royal butterflies, savage wasps, wise snails, and a host of other bugs inhabit the realm. Unfortunately, unbeknownst to the Kaldáre, dark forces simmer beneath the surface—literally. Below Insectdom is the foreboding Underworld, home to the reptilian Erkúns. The Erkúns, a warlike people, have long abided by the Peace of Tiba, a treaty that banishes them from the surface save for one ambassador. The current ambassador, the cunning Akran Súr, plays on the ambitions of a young snail king to open the door to terrifying subterranean creatures bent on claiming the surface at any cost. There’s plenty of action in An Insect Tale—assassinations and ambushes abound. However, several key battles are summarized rather than shown, obscuring some of the most pivotal and potentially exciting scenes. In addition, large chunks of time often pass without warning, making it difficult to follow the narrative. The match-up between the Erkúns and the surface insects also feels lopsided at times. The Erkúns—with their physical strength, magical powers, and hordes of bloodthirsty henchbugs—are virtually unbeatable right up until the moment they’re beaten. This makes it hard to root for the protagonists, who seem doomed for the majority of the novel. A map of Insectdom in the front matter is helpful for tracking the action. There’s also a preface that, while wordy in parts, explains the roots of the animosity between the Erkúns and the Kaldáre. With its battles, quests, political intrigues, and life-and-death struggles, An Insect Tale is a unique reimagining of high fantasy.